February 2015 - Page 2 of 4 - Pebbles, Inc.
Hi everyone! 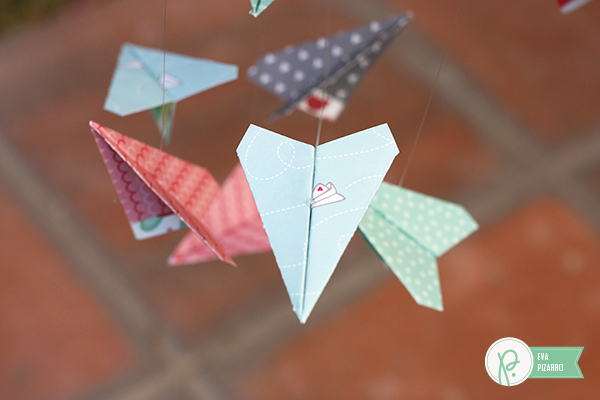 I’m Eva Pizarro and today I want to show you how to make a cute mobile for your child or to give as a gift. 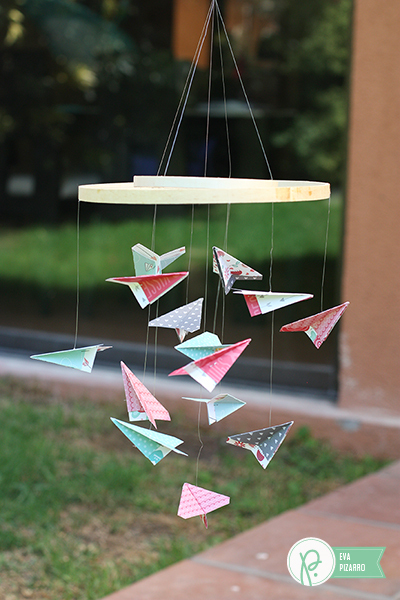 I recently had a baby boy (he’s the cutest), and I knew right from the start I wanted to make a mobile for his bedroom! 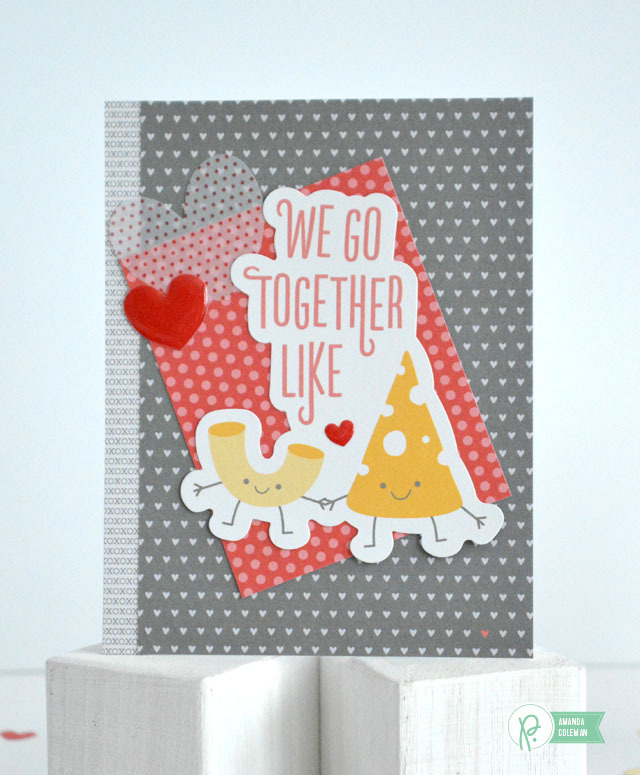 I found my inspiration in this paper from the We Go Together line. I just really loved that airplane! Let me walk you through this mobile step-by-step so that you can have one for your little sweetheart or to share with a friend! 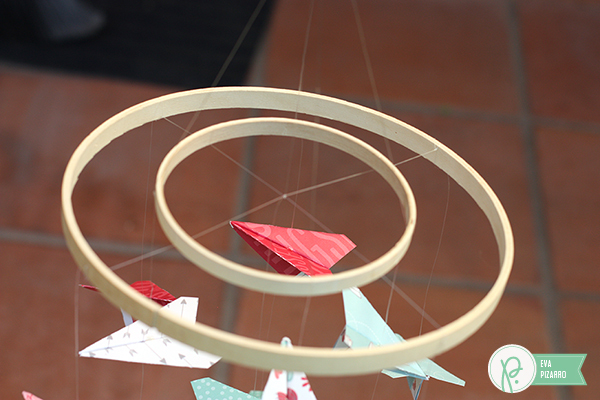 To make this mobile, you are going to need to get your hands on two embroidery hoops. 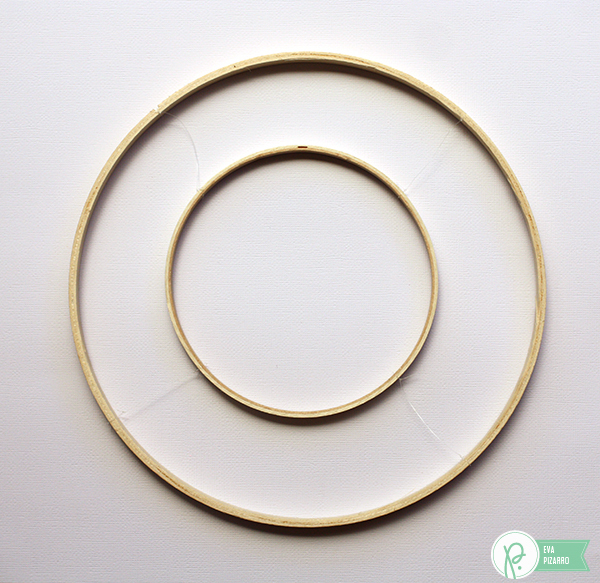 Use only the inner hoops and attach them together using fishing line. The airplanes are very light, so simple knots will be enough to hold them. Next, you’ll need to make your airplanes. I made 14 of them to fill my mobile. 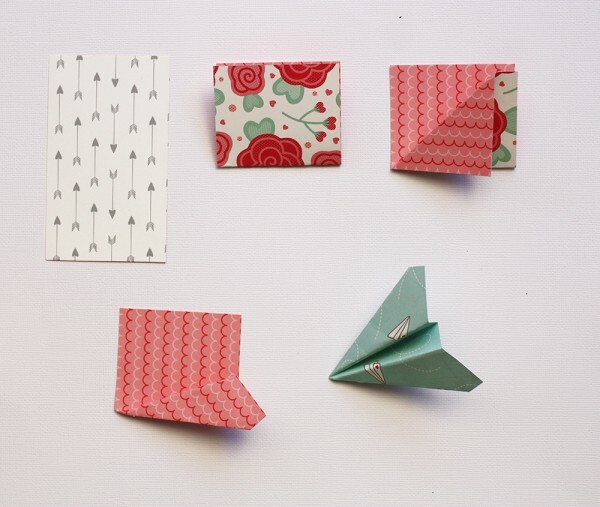 It is very easy to make these little airplanes – you probably remember how to fold them from when you were a kid, but just in case you don’t, here’s a step-by-step image. Start with a 4 x 2.5 inch piece of paper and bend it in half. Bend one corner to the fold (center of the paper). Then bend that triangle in half. This will create one of the wings. Repeat this process with the other flap to make your second wing. Use a stapler to keep the airplane together and prevent the paper from opening. 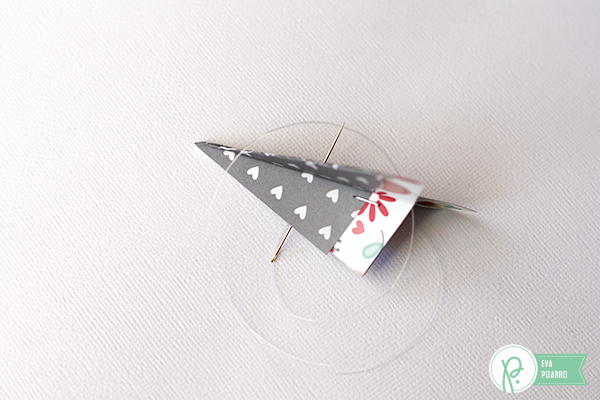 With a needle and some fishing line, make the hanging wires for the airplanes. Tie a knot on the bottom to hold the fishing line in place and use liquid glue to give the airplane the right direction (some facing up, down, straight). 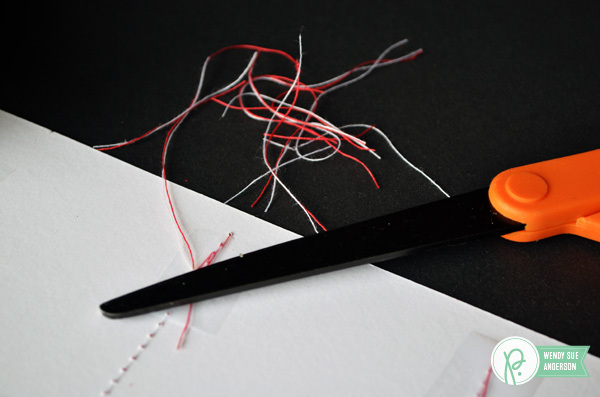 Attach the fishing lines to the embroidery hoops. I hung 4 airplanes in the outer circle, 8 airplanes (2 for each string) in the inner circle and 2 airplanes in the center of the mobile. Hi! 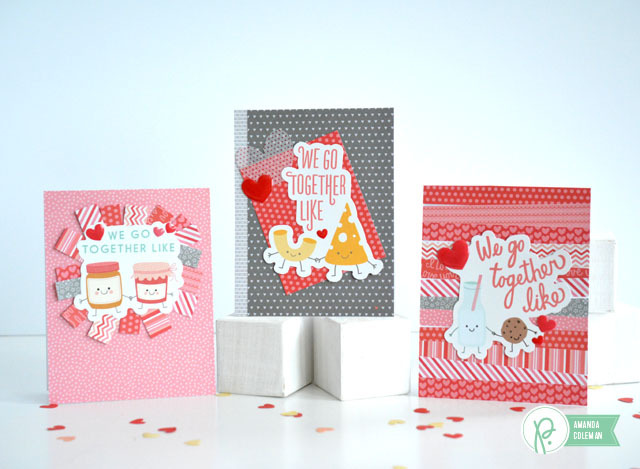 Renee here today to share a few cards I made using the Happy Day and We Go Together collections. You can send hugs, kisses, and love any time of the year. No reason or holiday needed…just because. 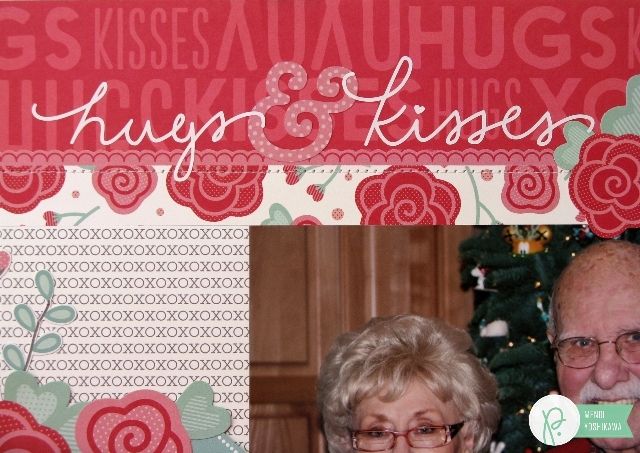 You can send your family or friends hugs and kisses and love with this card. I started with an A2 Kraft card for the base of my card. 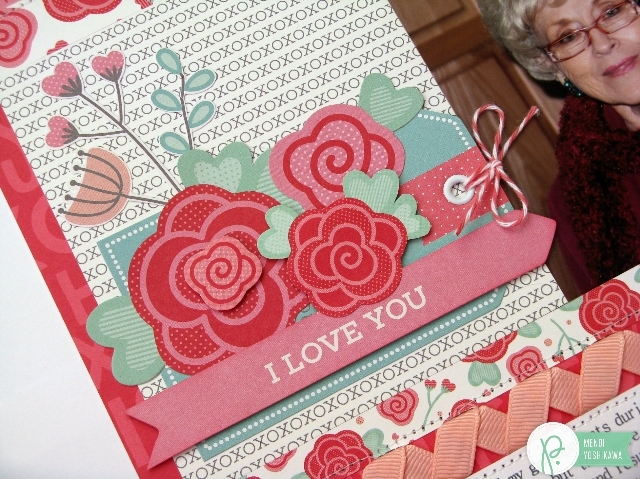 I layered the Sending Love and the U R Sweet pattern papers and added machine stitching around them. 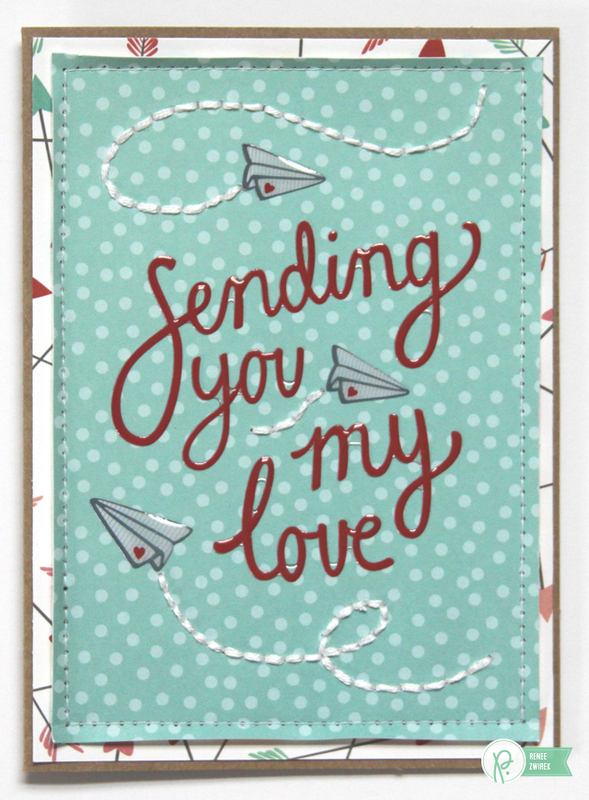 I added the “Sending You My Love” Epoxy Phrases Stickers along with a bit of hand stitched lines to the cute flying paper airplanes. 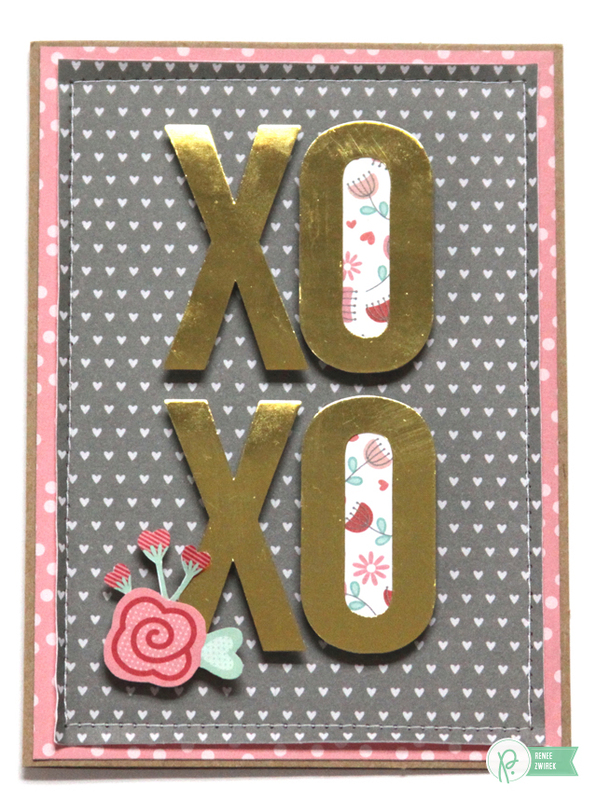 Here’s another card to send hugs and kisses to your family or friends. I started with an A2 Kraft card for the base of my card. 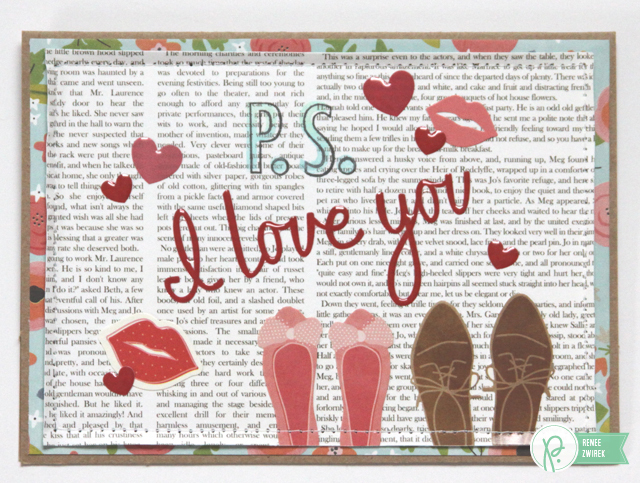 I layered the I Love You pattern paper and the Budding Romance design in the 6 x 6 Paper Pad and added machine stitching around them. I added the Jen Hadfield Home+Made Large Alpha Stickers along with some fussy cut flowers and pattern paper in the letter “O’s” (I used the Budding Romance design in the 6 x 6 Paper Pad again there). 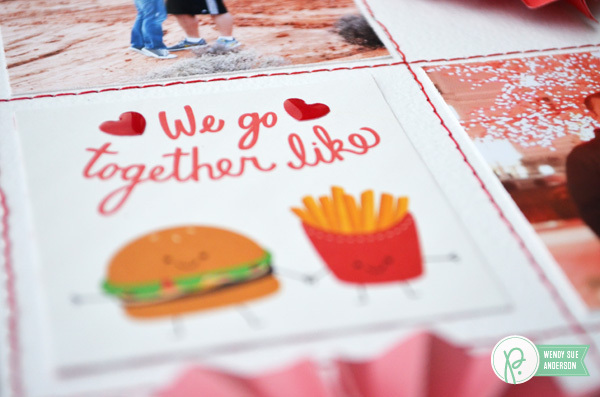 Here’s a card that would be fun for date night. Ooo La La. 😉 I started with an A2 Kraft card for the base of my card. I layered the Blooms and the Sunday Paper pattern papers and added machine stitching around them. I used the “I Love You” Epoxy Phrases Stickers for my title. 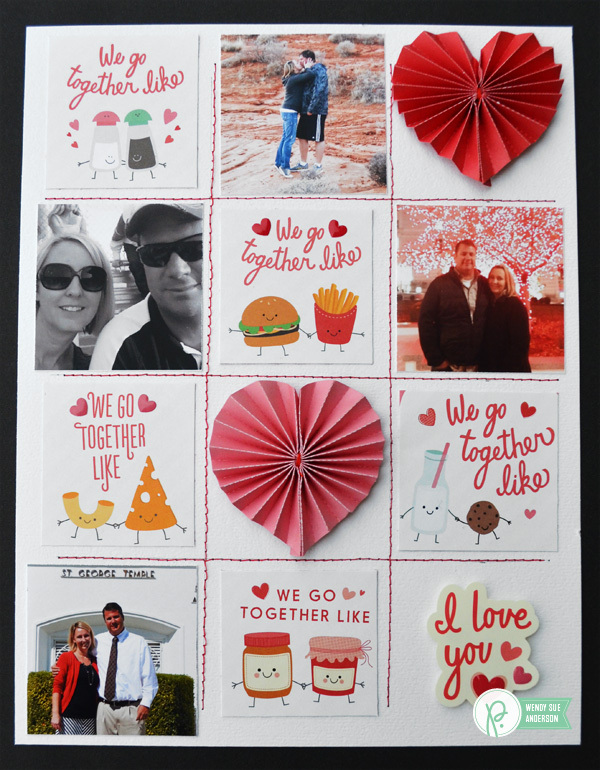 I also added the shoes stickers, kisses stickers, and heart stickers around the card. 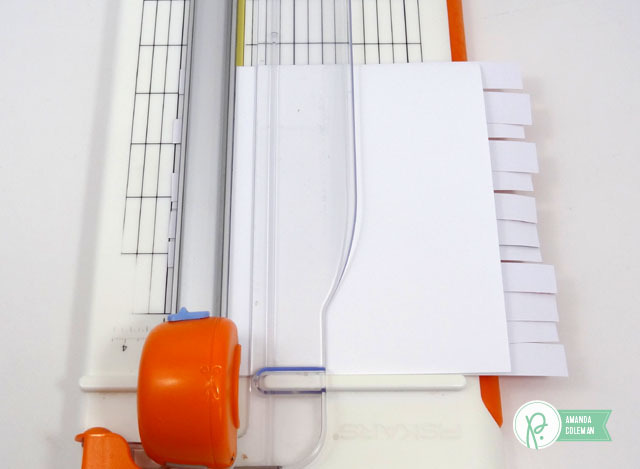 Amanda from Popper & Mimi here today with some fun ideas for using up those seemingly unusable strips of paper that remain leftover from a 6″x6″ paper pad. I love making and sending valentines, probably more than I do Christmas cards. 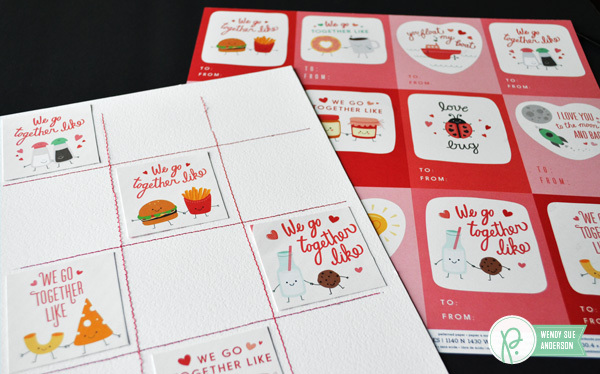 And the images from the We Go Together collection are just too cute to “save for later”. They must get into the hands of loved ones ASAP. Nothing says I love you like a smiling wedge of cheese and a grinning bottle of milk. I like that the sentiments aren’t so lovey dovey that you couldn’t send one to a long lost friend or a weird uncle. Have you ever seen a happier mac and cheese in your whole life? That funny little noodle is my favorite. 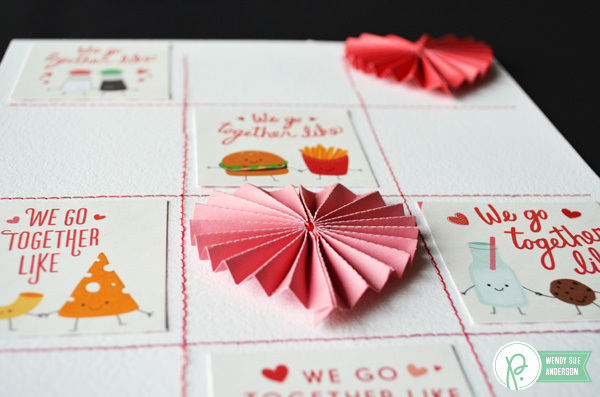 Paper scraps are perfect for creating contrast on a card. I placed the mac and cheese die cut on a piece of scrap paper to make it stand out from the background a bit better. 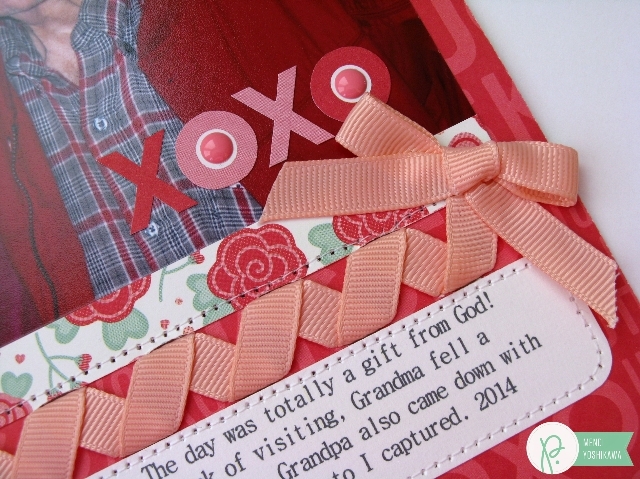 I also used a leftover strip of paper to create a decorative strip along the edge of the card. 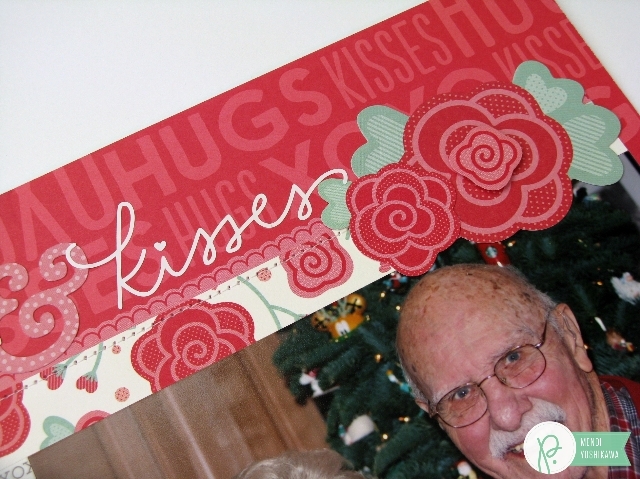 You can create your own card background using leftover strips of paper, too. 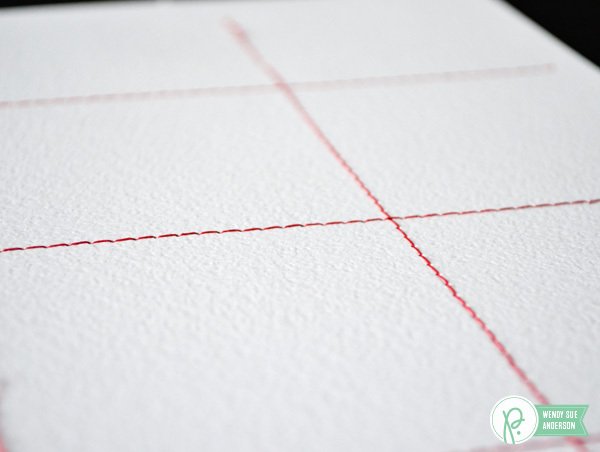 If you use a lot of 6″x6″ paper pads like I do, you know you always have that extra 1/2″ of paper after you cut the paper down to 5 1/2″. 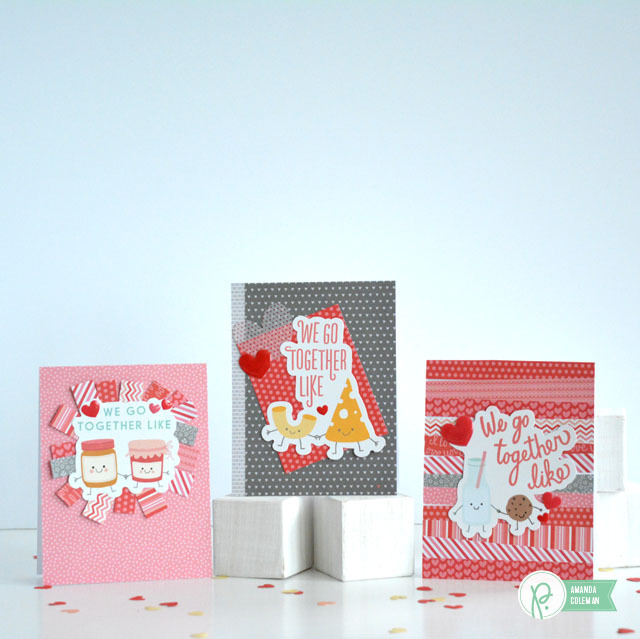 Put those babies to use on a card background! 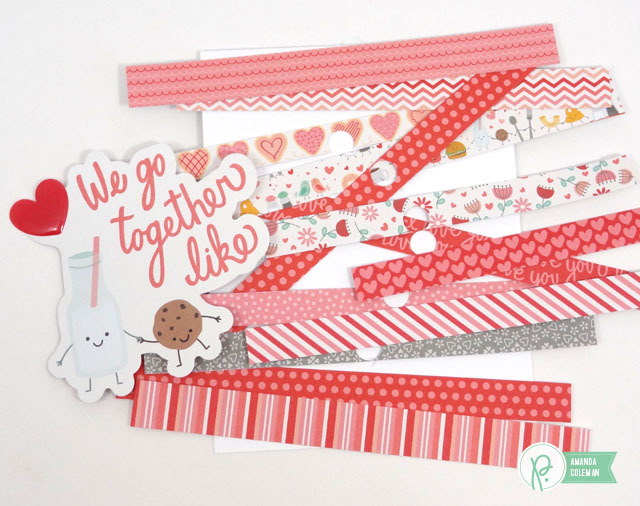 Layer leftover paper strips to create a fun card base. I knew I was going to use a large die cut as the focal point of the card, so I placed the strips with the holes near the middle where they would be covered up by the die cut. Paper crafting magic. 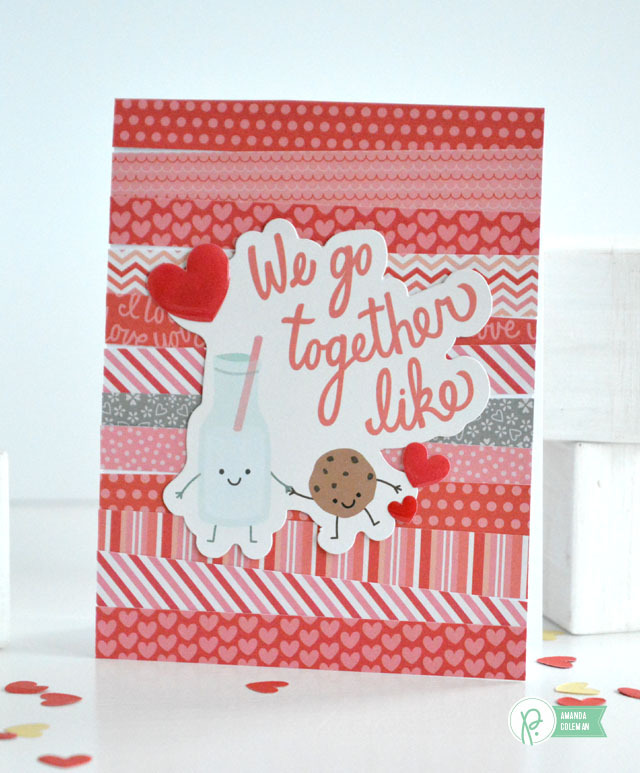 I started playing around with the little bits of paper that were leftover from the milk and cookie card and was quite happy with the result. 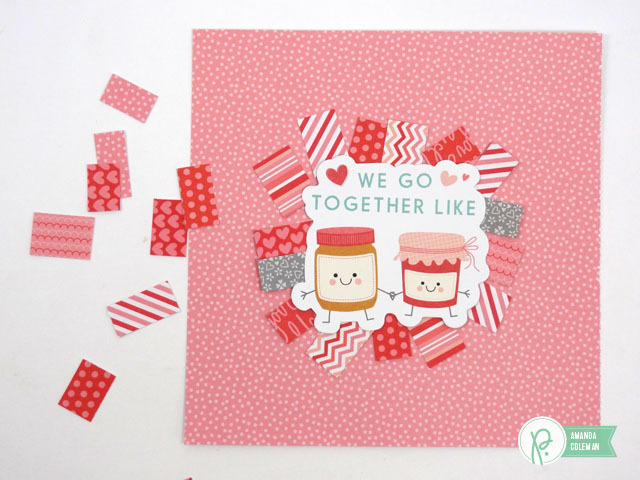 The little strips framed the cute peanut butter and jelly perfectly. 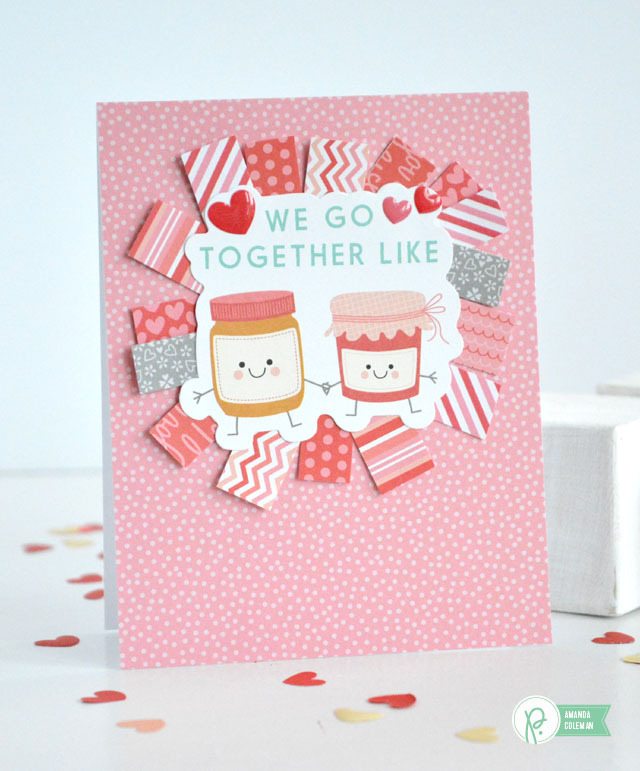 I adhered the strips of paper to the PB&J die cut by applying adhesive to the back of the die cut first. I simply placed the little pieces on the back and adhered the whole piece to a card. 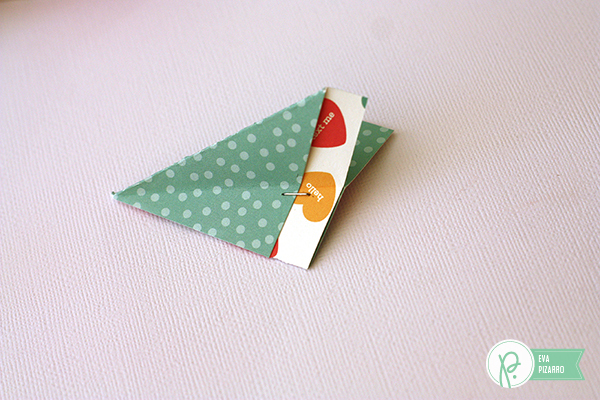 Super easy and super flat, which means it won’t cost extra to mail. First, decide how many boxes you want in your grid. If you’re working with a 12″x12″ background, this is pretty easy – 8 1/2″ x 11″ layouts are a little trickier – but if I can figure it out, so can you! lol. I decided to make my grid with three across and four down. 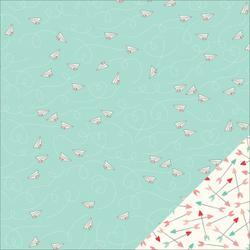 They are approximately 2 1/2″ squares. 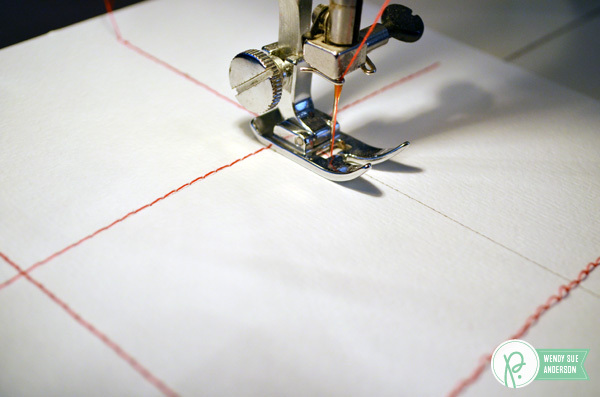 Start by measuring and marking where you want your lines to be. 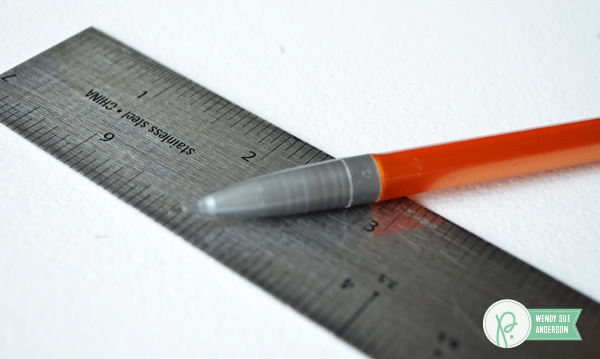 Use a ruler to draw lines – really lightly with a pencil. 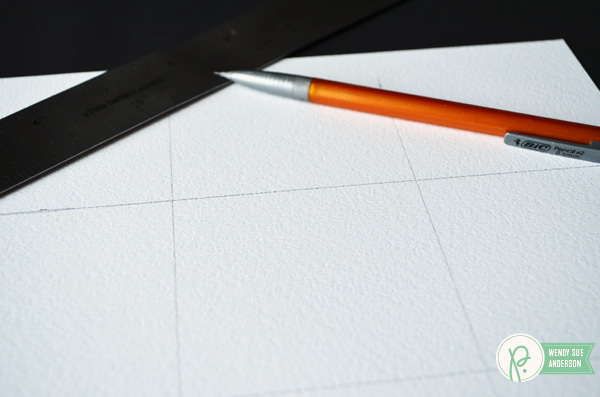 Now, this might be the trickiest part for all of my perfectionist friends – you’ve got to LET GO of the need for perfection. The back side of your layout might look messy (in fact, it will very likely look messy), but that is totally fine. 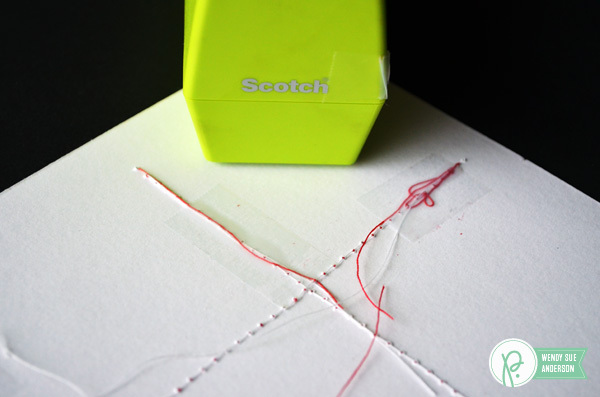 Pull the threads through the paper to the back and use good old scotch tape to secure them so they won’t pull through. 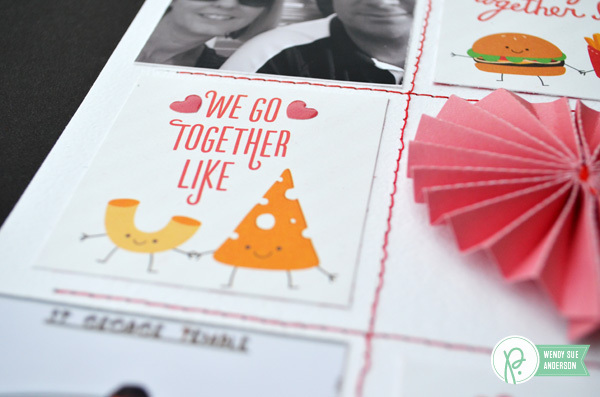 Now grab the sheet with the fun little “we go together” valentines. Cut some of the images into squares and place them in some of the grid openings. 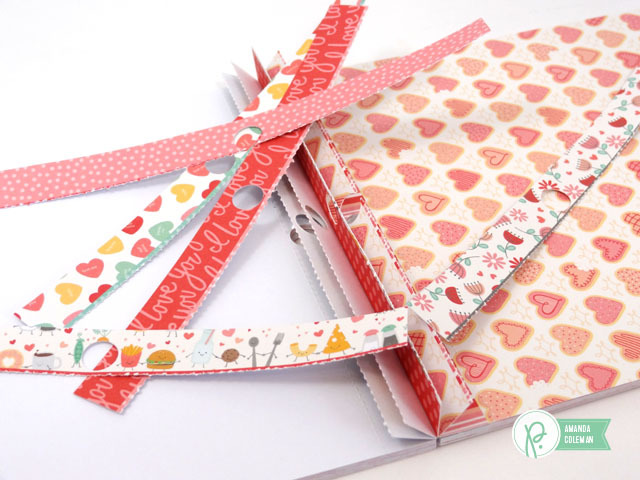 Add a few of the accordion hearts for interest and dimension – and just plain fun! I added the “I love you” sticker (on foam adhesive squares) and some additional epoxy heart stickers to add some interest and shine! I hope you’ll be inspired to take more photos with your significant other AND try out this stitched grid technique on a layout very soon.